I worked on my embroidery journal project over the weekend. I chose only motifs that I felt like stitching. This piece I call Spring, the promise and the beauty. The birds nest represents the promise, and the daffodil the beauty. I didn't feel motivated to put a lot of extra decoration on this project. My flower is made with needle lace, and the bird's nest with lots of couched down wool yarns. Spring has also brought us the opportunity to do some outdoor works, which satisfying, but also extremely tiring. The needlework suffers, but I'll be back soon with a new project. I often seem to need some time to re-group after finishing a bigger project like the dragonfly. Most of the time I am too busy stitching to plan out what is next. I did some stitching over Easter on another project I have going, but not much was done. I was taking advantage of the chance to watch the eider ducks, since the males don't stick around. The males have a beautiful black and white coloring and make a woo-wooo sound you can hear from the shore. Anyways back to the embroidery. After working with the cotton floss for a couple weeks, it was nice to get back to the wools. Really nice, in fact. It really is my new favorite material now. It's just so soft, and I love the way it looks on the fabric. The threads are thicker than cotton, so there is more dimension to the embroidery. If you rub against the cotton too much while you work on your project it tends to get a little fuzzy and loses its shine. Wool doesn't do that. It's already fuzzy to begin with. Which is why the wool looks matte, while the cotton is shinier. The loose fibers scatter the light. I've read many, many authors refer to this effect as the wools absorbing the light while cotton reflects it, but that simply isn't true. The amount of light absorbed determines the color, but the shininess depends on the how many directions the light is scattered by the surface of the material. The wool has a bumpy surface, so it scatters the light in many directions. It has very little shine. Ok, enough of the physics lesson. Time for the little sheep - which are always a favorite subject for embroidery! I used fairly simple stitches on this one on purpose, since these crewel projects have been generating inquiries from beginners. 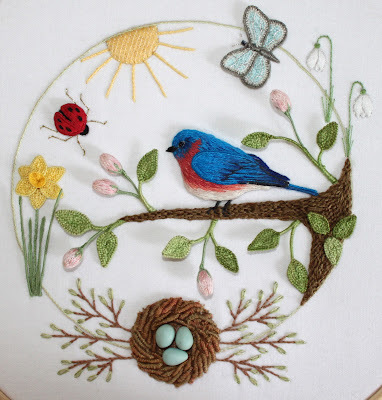 If I succeed in bringing a few new converts to embroidery, then I will have made one of my larger goals. And by the way, my other goal with the crewel, if I can manage, is to try to show that crewel embroidery is not defined by the patterns! They can be fun, modern and playful or whatever else you want to make them. I am planning on revisiting a few of the patterns I already have made with crewel and see what can be done with them. I already have the next project in mind, so I hope to be able to get started on it very soon! I am actually going to make an embroidery with a use in mind. It's going to be a cover for a little foot-stool we picked up at a flea market. And yes, it will be with wool again! Finally a finished project to show off! The inspiration for this one came from my own yard. We have a pond here and in the summer there are plenty of little flowers and bugs that live around it. A quick run down of the technical details! I have stitched the water with 4 strands of embroidery floss. Even though that is usually too bulky for long and short, it's exactly what I wanted. So much thread above the fabric means the water has a little dimension too. The cattails, whipped chain for the stems, then long needle woven picots with just one loop. I did the needle weaving with two strands so it wouldn't take forever. It took plenty long with even two strands! The cattail heads are turkey knots with 3 colors. I brushed them out with a toothbrush and trimmed them down. The sun is padded satin stitch. I don't remember how many times I padded it, maybe at least 4 layers. Probably should have just cut some felt. The lily pads are needle lace, also two strands. I find single-strand needle lace to be impossibly small. The pebbles on the bottom are polished stone beads I had. The shiny helps them look a bit "wet". 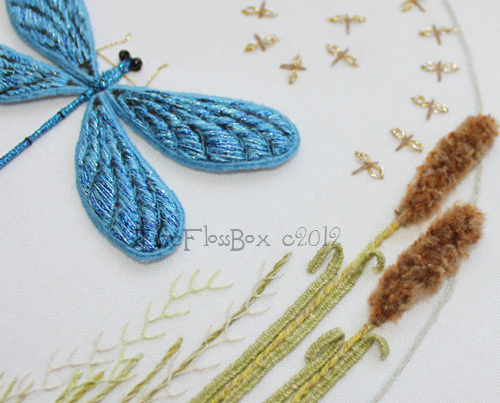 The small dragonfly or damselfly is probably really what I wanted it to be, has a couched down body, with a padded satin stitched wings. The wings are a bit different though. I padded them with satin stitches going the same direction as the layer over them. I added some blending filament for extra sparkle. It had just the right amount of thickness for the wings to stand out even on the white fabric. The large dragonfly body is made of a thread-wrapped wire that I couched down.I did the wings with wiring. I used the slooow method for the blanket stitching around the wire where you bring the needle up and down, not pick up a bit of fabric. It took time, but I do believe it's the most even button-holing I have ever done. The wings are filled with metallic DMC thread mixed with regular cotton strands. Gives both shine, but a little texture too, since I had 3 strands in the needle. A quick note about color. I didn't plan so much ahead. I was using a real dragonfly for the small and large, so their colors were already determined. The little flowers are marsh marigolds, which are yellow. What I did do though, was try to make the color more complicated. Everywhere that I have used more than one strand, which is most of it, the colors are a mixture of colors. The only other exception is the sun. It isn't actually that hard to blend colors. You need a base color, then decide if you want darker highlights, lighter highlights, and whether you want to subtly change the color toward another. Anyways, if you are still with me, I just want to say quickly, that everything is pretty much based on something real. The little tiny flies in the spiral are just that flies. The kind that the dragonfly lives on. This project was just the right size to be a challenge without taking a really long time to do. I now have three projects that are similar in size and style that I am officially calling a series now, named "All creatures great and small." Below are the other two. Next I think I need some "great" creatures. I'll be back with a new one soon, but first I do believe it's time for some more crewel!